Vegan cookies are the way to go when it comes to making dairy-free and egg-free sweets. Even meat eaters can go for these as they are hearty. These vegan no-bake cookies are great for after-school snacks or quick, healthier treats. To dress them up a bit, drizzle some melted dairy-free chocolate over the cookies after they've cooled and serve them with a bit of dairy-free soy ice cream for a full-on after dinner vegan dessert. 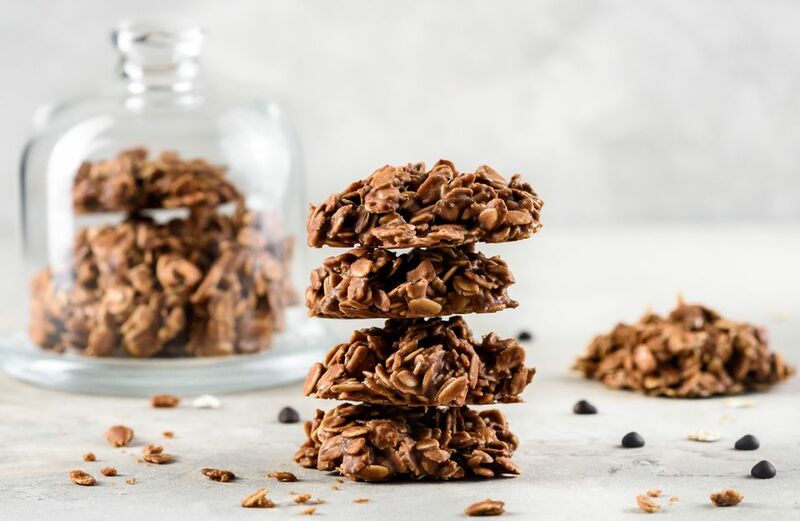 Though this recipe is no-bake it does require a short boiling period for the mixture which requires precision to ensure that the cookies are not too dry or crumbly or not cooked well enough to form properly. Line a large baking sheet with wax paper. Set aside. In a medium-sized saucepan over medium heat, combine the coconut milk, sugar, cocoa powder, dairy-free chocolate chips, peanut butter, and soy margarine, stirring to combine. Bring the mixture to a boil, and boil for 2 minutes without stirring. Remove from heat and stir in the oats until evenly distributed. Drop onto the prepared sheet in small mounds and let cool completely before serving, which should take about 15 minutes. This vegan cookie recipe will allow cookies to be stored at room temperature in an air-tight container for up to 1 week. You may also use aluminum foil to keep the vegan cookies separated so that they do not stick together. Refrigerated they can last another week. These cookies should not be heated and are best served cold or at room temperature. This recipe incorporates peanut butter, so if you have a peanut butter only allergy and are not allergic to tree nuts, you can substitute almond butter. If you are allergic to tree nuts as well as peanut butter, you can omit the peanut butter and use 1/2 cup of coconut oil instead of the nut butter provided that you are not also allergic to coconut. **This recipe is suitable for dairy-free, egg-free, and vegan diets, but as with any recipe intended for persons with allergies or dietary restrictions, make sure to read all nutritional labels carefully to make sure that there are no hidden dairy-derived ingredients (or other allergens, if these apply to you).